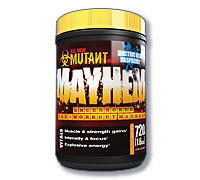 MAYHEM was spawned to take pre-training supplementation to the forefront of the bodybuilding world. Never before has there been a pre-training supplement of such serious magnitude. Guaranteed you have experimented with other pre-training formulas and you've probably had some success. But MAYHEM is not formulated to give you just "success". MAYHEM is here to shatter all your expectations of what it feels like to be on a truly uncensored pre-training madness formula. Down a super-packed dose and almost immediately you will start to transform your thinking. Thoughts of enraged intensity begin to circulate in your entire being. Weights that previously owned you will be crushed. That dreaded point where your energy repeatedly faded in the past will now be a distant memory, as your body will be electrified on seemingly endless surges of energy. Where other formulas fail you, MAYHEM delivers! Advanced ingredient scavengers seek out lactic acid to help neutralize its lifting limitations unlike anything else so you can lift heavier and train longer. Did you think that the Mutant scientists forgot about your number one, be-all-and-end-all goal of getting huge? Not a chance! MAYHEM is injected with proven ingredients to ignite the muscle building process deep at the cellular level for rapid and dramatic gains in freaky muscle and strength! Remember that best workout you ever had in the gym, because when you dose with MAYHEM it will make that session seem like a beginners yoga class. This experimental hybrid formula does it all with an uncompromising hell bent purpose. The leading-edge Mutant scientists packed so much action oriented, scientifically researched and developed ingredients into MAYHEM that it is virtually impossible to take this supplement and not experience a thunderous wave of effects with every dose. MAYHEM sparks hyper-stimulation for killer intensity and razor sharp focus to annihilate every shred of iron in the gym. Every muscle-mutating ingredient in the bleeding-edge MAYHEM formula works as hard as you do to soak your muscles with more and more anabolic rich blood while you pump out the heavy sets and reps. Bottom line, when you down a phenomenal tasting dose of MAYHEM you will train harder and longer with more energy, you will build freaky amounts of dense muscle, your strength will shoot through the roof and you won't crash hard - ever! Whatever your poison - muscle growth, strength, power, intensity - MAYHEM delivers with every dose. How? Well it's simple. Detailed scientific research and real world testing on some of the freakiest mass monsters on the planet. This insane formula wasn't tested on lab rats, soccer players or fitness enthusiasts. MAYHEM is for Mutants only! It's not for the faint of heart. This formula is seriously insane. In fact, MAYHEM is so powerful that we have to put a warning on the label that you never exceed the recommended dosing protocol - and this isn't hype. A single highly charged dose and you will be flying for hours. And did we mention that you don't have to choke it down? Believe it or not, you can actually take an incredibly effective supplement that not only delivers sick results but tastes great too! You be the judge! 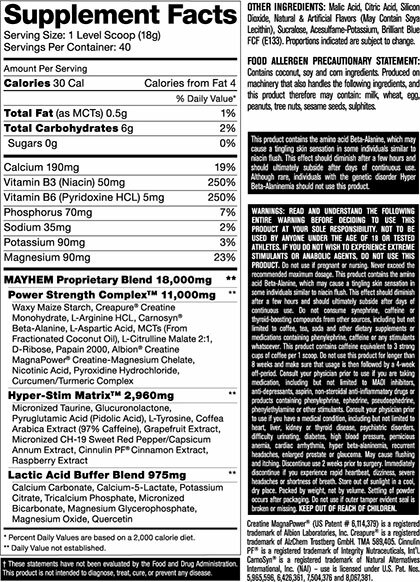 Forget every other pre-training supplement you have ever taken in the past, throw out what you're using now, they are all a joke compared to MAYHEM. This will be the last pre-training supplement you ever freakin' buy - guaranteed. But be warned, the MAYHEM madness experience can be addicting and you will have to exercise extreme self-control when taking it! Enjoy the ride.